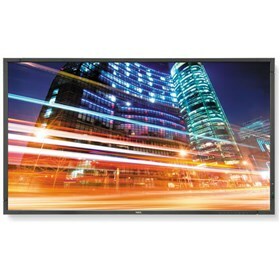 The NEC P553 is a 55" LED backlit professional-grade large screen display. This display has 1920 x 1080 resolution that displays incredibly clear imagery. The LED backlighting allows for reduced power consumption while the carbon footprint meter enables responsible use of the display conserving green gas emissions in real time. The input switching speed between source transitions minimizes downtime. The P553 features industrial-strength, premium-grade panel with additional thermal protection, internal temperature sensors with self-diagnostics and fan-based technology that allows it for 24/7 operation. This monitor features 178° horizontal and vertical viewing angles and brightness of 700cd/m2. The NEC P553 has many exciting features for users of all types. See the NEC P553 gallery images above for more product views. The NEC P553 is sold as a Brand New Unopened Item.